We spent 2 nights in Goa to recharge our batteries after the dreadful experience in Gokarna. After venturing out to Candolim Beach on the first evening, the massive crowds made us beat a hasty retreat back to the Hotel. Goa gets the maximum share of tourist arrivals in India, some 2.7 million last year. After the near deserted beaches we found further south, the crowds came as quite a shock and we ended up spending all of the next day in the hotel pool. As I steadily turned a deeper and deeper shade of red, the Boss sensibly kept to the shade to protect her lustrous skin. Goa has changed a lot since I first visited many years ago. 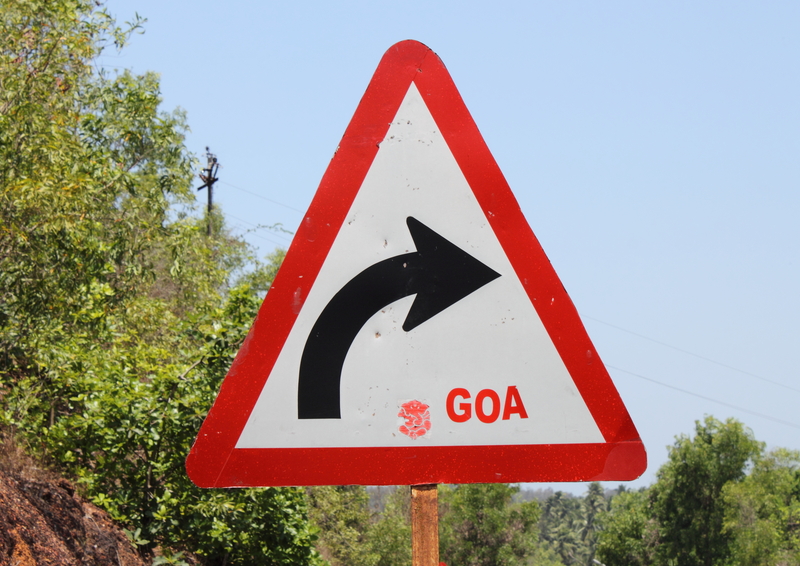 Goa receives approximately 13% of all foreign tourist arrivals, many of whom must be Russian as just like Pattaya in Thailand, half of the signs seem to be written in Cyrillic script. A lot of wealthier westerners appear to have made the place home now replacing the penniless hippies of the past. I spotted two Northern European looking gentleman driving around in a beautiful yellow Ferrari much to the delight of all and sundry. When I explained the price of the car to the Hotel watchman, he could not understand why anyone would pay so much for a car that only seats two! Making maximum use of the hotel internet (I have struggled with internet all the way up the coast but here in Goa even the beach shacks have free Wi-Fi) I managed to find something quite different for our next few nights, a perfect antidote to the hustle and bustle in Goa, but for that you will have to wait for my next post. This entry was posted in Goa, India, Life, Travel and tagged Beaches, Ferrari, Goa, Road Trip, Russian, Travel by Kiwigypsy. Bookmark the permalink.